Wonderfully relaxing sunny and happy holiday bach in Raglan situated in a fantastic location right opposite the harbour and next to town. We cater for adults looking for a getaway destination. 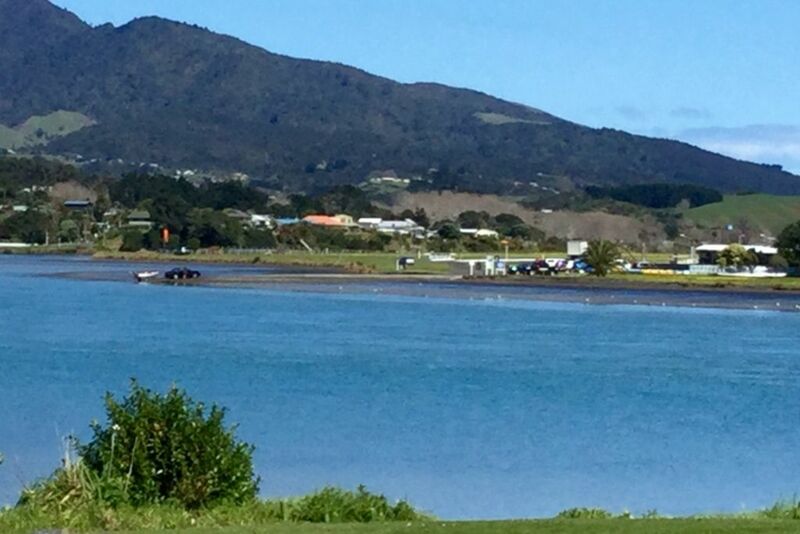 Enjoy your holidays and/or work from here and leave the car parked while you enjoy Raglan's harbour, beaches and cafes at your doorstep. The harbour is just across the road with a walkway to take you to the Kopua Park and swimming beach just 2 - 3 minutes walk away.There fabulous water and Karioi mountain views from the lounge and deck. The cafes are literally across the road and you can walk to a beautiful safe swimming beach by the aerodrome. The house is an very comfortable beach bach evoking a holiday feel as soon as you arrive. Plenty of room to park a boat and a fully fenced section. All the beds are very good quality and very comfortable. Public Holidays and long weekends $180 per night for 2 people, minimum 3 night stay for long weekends and public holidays. Easter weekend 4 night minimum stay. Anzac and Waitangi weekends will be $180 per night . We Have 7 night minimum stay from 24th Dec-6th January. Linen (sheets,pillowcases and towels can be provided at $25 per person per stay. There will be a and50-$100 bond depending on number of guests. Wi-Fi is available on the property. This a Smoke FREE property. Children 15 yrs and over only. We look forward to sharing our batch with you. Children 16 yrs and over. We pride ourselves on the presentation and cleanliness of our home. We do ask that guests do the dishes andamp; leave the property as they found it before departure and if staying through a Monday put out the rubbish andamp; recycling to the sidewalk on Monday mornings (collection bags provided). Fantastic location right opposite the harbour and next to town,1 min walk to swimming beaches, cafes,bars and restaurants. 10 Walinui definitely the place to stay. Five days at 10 Wainui with excellent weather was wonderful. Close to shops and the bach was clean and had everything we needed. No need to take the car out . Great communication with owners and would totally recommend to others. Thanks so much. Awesome spot, close to beach and village. Roomy kiwi bach in great location. Relaxing break at a clean & well equipped bach. Thank you for a lovely few days away. Excellent location and hosts. Would use again and lots of space for everyone. Thank you! Great location and very clean and tidy house.